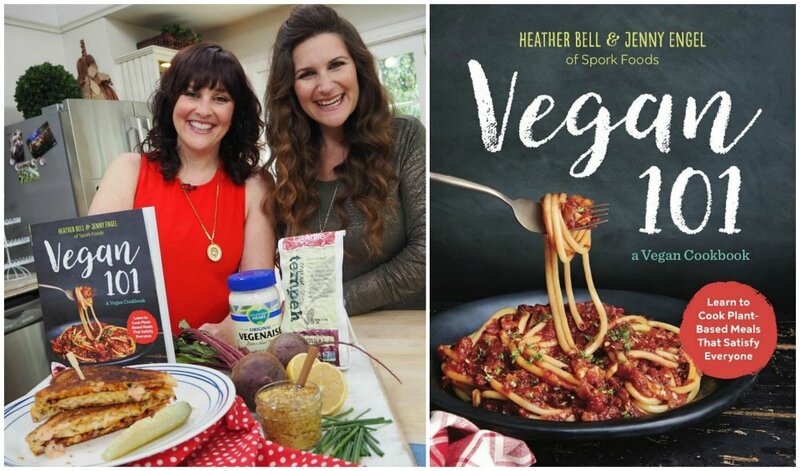 Sisters Jenny Engel and Heather Bell, owners of the L.A.-based gourmet vegan food company Spork Foods, are out with an amazing new cookbook, Vegan 101! I’m super-excited about your new book Vegan 101: A Vegan Cookbook: Learn to Cook Plant-Based Meals that Satisfy Everyone. What inspired you to write it? We’re so happy you’re excited about it! Our constant source of inspiration comes from our student base. We teach about 10,000 people a year how to make vegan dishes, so we have a lot of conversations with people who are longtime vegans, and many others who aren’t vegan at all, but are coming to class to try it out. Almost everyone requested quick and simple vegan dishes that taste great, so that’s what we focused on for this cookbook. We really want these dishes to be accessible to anyone. Will this book please vegans and non-vegans alike? Oh yes! Since most of our student base isn’t vegan, it’s imperative that we create dishes that everyone will love. We take the challenge very seriously! 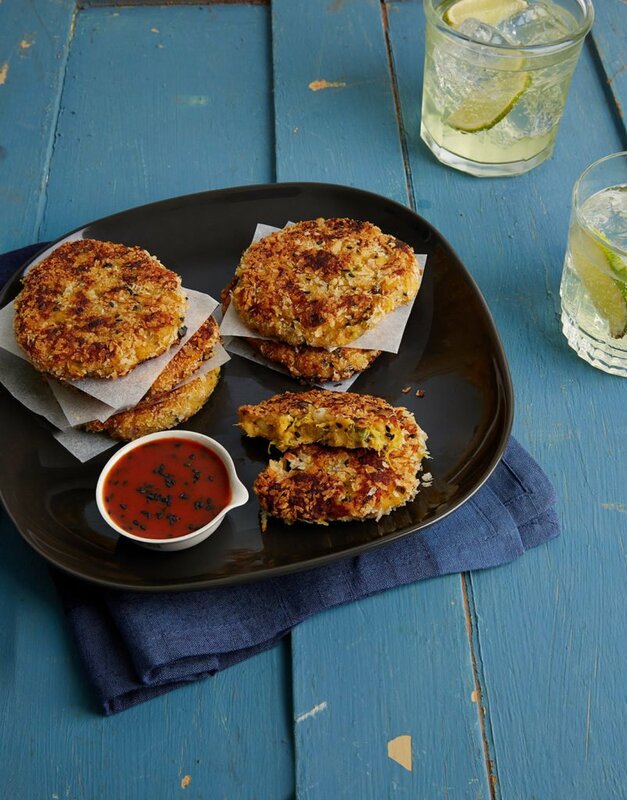 Acorn Squash Fritters with Korean Spicy Sauce from Vegan 101! Are there recipes that will make people forget that they are eating vegan? Absolutely! What comes to mind is our Acorn Squash Fritters with Korean Spicy Sauce. Essentially, this fritter is crunchy on the outside and soft in the middle. There’s a sweetness about the squash, and paired with the spice from the sauce it comes together really well. The soups are also very pure and simple, like our Velvety Kale Soup with Cashew Cream. It’s decadent but nutrient-packed, leaving people satisfied and proud of themselves for making such a healthy choice. You both have a great sense of humor. What keeps you always smiling? Is is the food? That’s a really sweet question! What keeps us smiling is being able to spend each day together. It had always been a dream of ours to have a sister business, and now that we get to run it together, what’s not to smile about? The food is absolutely part of it, but what’s more is that we get to support a vegan lifestyle each and every day for a living. Velvety Kale Soup with Cashew Cream by the Spork Foods sisters! What’s your funniest story of something going wrong in the kitchen? We once had an assistant put their hand through a full cheesecake in a spring form pan while taking it out of the oven in a cooking class! Luckily we had made one in advance so all was well! It wasn’t funny at the time but now it’s hilarious! Who would you love to have a meal with, living or dead? We’d love to have a meal with Bob Marley. His positive message is so widespread and special; you can feel it in every song you hear. His music makes people feel good, and so we’d want to make him feel good with a belly full of organic vegan food. Where did you learn how to cook? Oh this is a good one, with a three-part answer! Our Mom cooked constantly while we were young and made huge pots of food, encouraging neighbors, friends, and family to just drop by. We loved how welcoming she always made our home, so we asked to take cooking classes as kids. Mom and Dad sent us to a kids’ cooking school when we were about five and seven, and although it wasn’t vegan, we learned the basics and fell in love with the process of cooking. Later on, we sent Jenny to the Natural Gourmet Institute in NYC to further her education. Who are you most influenced by? We’re most influenced by animals. At the core of what we do is actually activism. There are so many ways to be an activist. Some people hold up posters outside of places who are abusing animals. Others give money to great causes. We have chosen to use our love of cooking to prevent cruelty to animals. We believe that animals are not for us to use in any way. The cooking skills we developed we share with our students so that they can also make meals that change people’s minds about food and ultimately save lives. 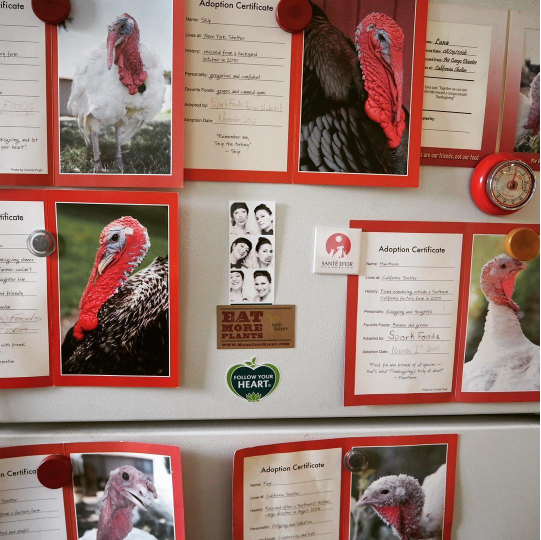 Adopt a Turkey Project adoption certificates on the refrigerator at Spork Foods headquarters (via the sisters’ Instagram account, @sporkfoods). You’re being interviewed by Farm Sanctuary. Why do you think people should support Farm Sanctuary? Farm Sanctuary is near and dear to our hearts for many reasons. One of our favorite programs is the Adopt a Turkey Project. Each year for the past 10 years since we started our business, we adopt a turkey in honor of Thanksgiving. We have their photos on our refrigerator for all of our students to see, and they absolutely love it. We’ve even gotten to go to Farm Sanctuary and sit with turkeys and just be with them. Many people don’t know how sweet and cuddly they are. And how much they love eating kale and cranberries. Farm Sanctuary rescues animals in danger, advocates for them and educates people about the importance of kindness to all creatures. How could you not get behind Farm Sanctuary!? We will continue to participate in the Walk for Farm Animals and donate to galas for as long as we’re in business. What’s next for the two of you? A little birdie told me someone is going to be a mommy very soon. 2017 will be a really fun year for us! Heather will be a first-time Mommy to a little girl, while Jenny’s boy, Evander Bluejay, who will be one, shows her the ways of the world. While those two vegan babies get trained to take over Spork Foods one day, we will be actually launching a secret food product that’s been in the works for years. We’re so excited about it and can’t wait to give you more details when the time is right! 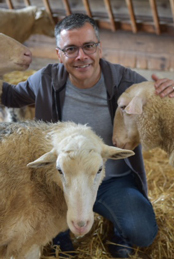 This is the the second installment in the “Book Barn” series with Farm Sanctuary Board Member James Costa. An ardent animal activist and a regular contributor to Litbreaker Media, James is the director of the documentary Lunch Hour, which looks critically at childhood obesity and school lunch programs. Currently, James is working on a new documentary about Native Americans and diet. Read the previous Book Barn installment, a Q&A with Kathy Freston on her latest, The Book of Veganish, here. This entry was posted in author, book, Book Barn, vegan by Farm Sanctuary. Bookmark the permalink.